Rehabilitating asphalt-paved roads has been growing in popularity thanks to the availability of more cost-effective solutions. One industry-leading method is hot mixed-in-place recycling (HMIPR), an on-site method for deteriorated blacktop pavement rehabilitation. 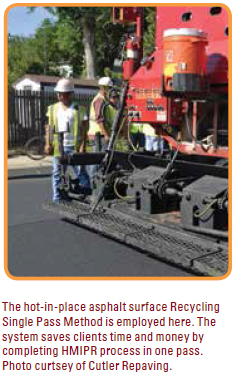 The three most common hot mixed-in-place recycling processes are surface, repaving, and remixing. Surface recycling starts with removing a deep layer of the asphalt, which is then recycled, re-applied, and compacted. Next, a thin overlay of new hot mix asphalt is placed on top of the recycled layer. Repaving recycling involves placement of a new hot mix asphalt layer atop the recycled layer in one pass, followed by compaction. Finally, remixing recycling blends old and new asphalt with additives and additional aggregates. The new mixture is applied, and the roadway is compacted. 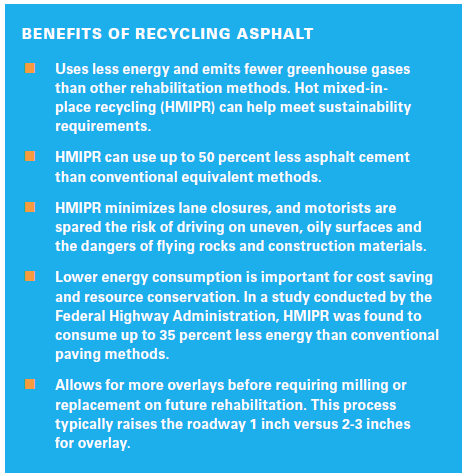 The benefits of HMIPR are numerous: it uses up to 35 percent less energy than conventional paving methods; requires up to 50 percent less asphalt cement than conventional equivalent methods; and minimizes lane closures, sparing motorists the risks of driving on uneven, oily surfaces and the dangers of flying rocks and construction materials. Despite HMIPR’s benefits, only a few state departments of transportation use HMIPR methods regularly due to problems with its durability on certain projects. When these problematic projects were reviewed, however, the issue frequently was found to be failure to perform a thorough surface evaluation in advance to determine whether HMIPR was the right solution. To ensure that the reconditioned pavement will not deteriorate prematurely, it is essential to first evaluate the existing pavement’s constituent materials and properties. Variability within the pavement materials, gradation, or asphalt content can affect the properties of the applied HMIPR pavement. If not accounted for during mix design, this variability may affect the quality of the product and impact performance. Once HMIPR has been found compatible as a rehabilitation method with the current surface, the existing asphalt pavement is assessed. This process includes heating and removing the asphalt. After its properties are determined, the recycled materials are mixed and laid down to form a leveled pathway. A layer of fresh hot mix asphalt is then applied and the roadway compacted. to maximizing the performance and value of HMIPR. For municipalities and civil consultants who may be looking for cost-effective solutions to asphalt road rehabilitation, Terracon can provide an opinion on which roadways may be good candidates for this process and, if so, recommend what type of rejuvenator to use and its application rate. Mark Wells, P.E., PMP, is a senior project materials engineer in the Houston office. He oversees projects including government facilities, educational facilities, convention centers, roads, bridges, commercial buildings, airports, recreational facilities, mid-and high-rise structures, and infrastructure. Mark has more than 30 years of experience in quality assurance/quality control inspection and testing services with an extensive background in soils and earthwork construction, asphalt recycling, pavement investigations, and road and bridge design.